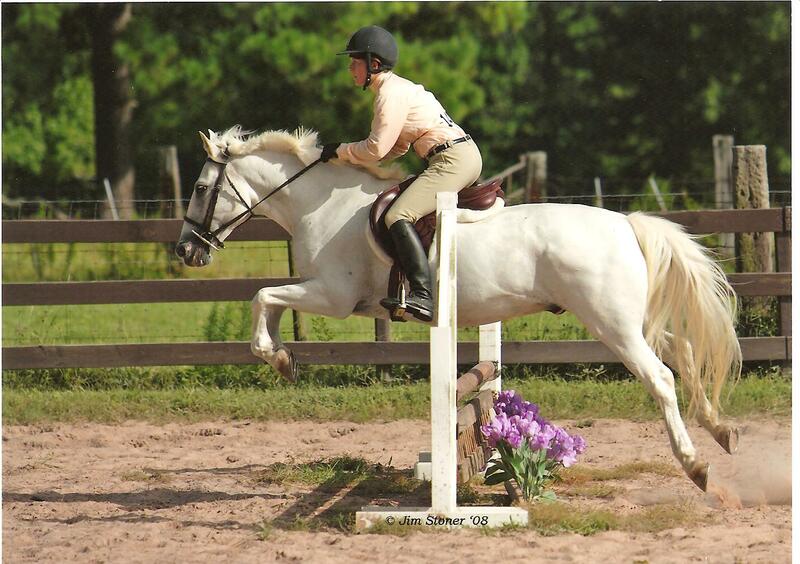 Snowbaby Go with Lauren on board making a pretty good imitation of a pony hunter. He is a cute one! Breed: Pony of America Age: 19 How Obtained: Horse Rescue-eight years ago-but then was traded back to the rescue for another horse. Snow went to a bad owner and ended up at the ASPCA. We, with help from our friend Kathy, adopted him from the ASPCA to a forever home with us. Best Traits: Snowney attracts fans. Kids love him. He is a show veteran and while not perfect he always does pretty well. Worst Traits: Snow first came to the rescue because he would decide to simply lay down (with a rider on his back) when he was done working. He has done this a few times since coming to us, most notably with Caitlyn. It is scary but he just lays there. Also, the list of riders that have fallen off of him is huge (let’s see off the top of my head-Lauren, Caitlyn, Stefani, Cara, Rachel, Arianna, Desi, most recently Allison and my granddaughter Jordyn), but mostly without injury. He’s just easy to fall off of since he is a little round, is prone to sudden stops and occasional bucks. Background: Snowney during his time between rescues was starved. It influences his behavior-he will eat most anything. One day I came out to find him covered in blood but he had really eaten every plum from the tree and was covered with juice. He can be quite helpful in always cleaning up spilled grain or hay. Life at Six Meadow Farm: Snow is currently at another farm. Although Jordyn loves him dearly, economics dictates that horses that can work need a job. Lauren is too old to show him in the pony division any longer. He is serving well for many new young riders and one day when Jordyn is ready he will return home to stay. He belongs to Six Meadow Farm, just think of it like he is away at camp. Dressed for one of her first horse shows, Jordyn worships her Snowney. This entry was posted in The horses of Six Meadow Farm by Exechorseluver. Bookmark the permalink.